Cankarjev dom – Cultural and Congress Centre Ljubljana hosted on 27 September 2018 POMP Forum, the biggest content marketing event in Slovenia, for the 9th consecutive year. 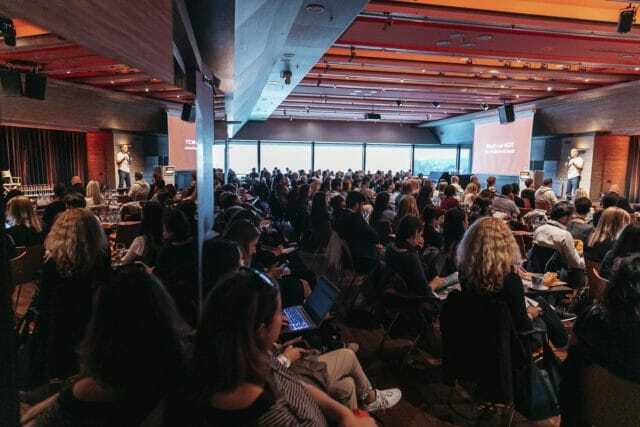 The POMP Forum, the biggest annual event in the field of content marketing in Slovenia, for the 9th consecutive year took place in Cankarjev dom – Cultural and Congress Centre’s CD Club (Klub CD). PM, poslovni mediji d.o.o., the organiser of the conference, chose the CD Club nine years ago due to its wish of organising a conference away from impersonal conference halls: »We wanted a club space, a lounge where participants would have a pleasant and relaxing time,« Anja Garbajs from PM, poslovni mediji told for Kongres Magazine. However, the CD Klub’s advantage is not just in its lounge atmosphere, but also in its location and views from its terrace: »Due to its position in Ljubljana’s straight city centre and due to its terrace providing beautiful sight towards the Ljubljana Castle on one side and towards the Alps on the other, the CD Club guaranteed for an ideal and perfect choice,« emphasized Ms. Garbajs. What especially impresses you about the CD Club? No wonder then, that PM, poslovni mediji d.o.o. organised the POMP Forum in Cankarjev dom’s CD Club for the 9th time already. This year, over 200 participants enjoyed in the pleasant and relaxing environment while listening to the outstanding domestic and international experts. The conference topic was focused on the content marketing’s encounters with obstacles and challenges that need to be overcome with creativity and technical knowledge. Thus, the lectures of European and North American lecturers presenting the latest trends in content marketing were merged under the slogan “Polygon of Content Marketing”. As part of the event, this year’s 39-member international jury selected the best works in the industry. At the ceremony, 10 prizes for the winners in each category, one prize for special achievements, and the main prize of the VELIKI POMP 2018 – Content Marketing Project of the Year, were awarded. The main prize was earned by the Agency 101 for its Hidden Escape Room, a project prepared for UNICEF Slovenia.